Missing the warm weather, I wanted to share a hike that Scott and I took last summer. It was a beautiful day to get out and about. The sun was shinning, backpack was packed and we hit the trails. During the hike, Scott shared with me that he is a nudist and loves to hike naked. Being the gentle man that I am, I had no problems with Scott freeing himself to enjoy the day. 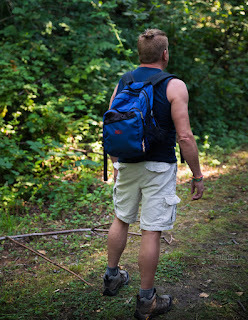 Scott looked fantastic in his new hiking gear, boots, jock and backpack. But than he told me that he had brought along another jock that might even be better for today's hike, so I had him put that one on. After working up a sweat on the trails, it was time for a little cool down, so down to the creek we went. Even with the sun fully out, a nice moon is always welcomed! What a great day to get out and enjoy some great company, a nice hike and beautiful sites.